Preheat oven 350 degrees. Spray pan with baking spray or butter and flour 12 standard muffin cups. To make batter whisk flour, baking powder and soda, salt, nutmeg and allspice. In a separate smaller bowl with electric mixer beat butter and brown sugar until light and fluffy. Beat in eggs one at a time. With mixer on low, add flour mixture in three additions, alternating with two addition of pumpkin puree. Spoon 1/3 cup batter into each muffin cup. Bake 30 minutes. Meanwhile in another bowl combine granulated sugar and cinnamon. Once muffins are out of oven cool 10 minutes. 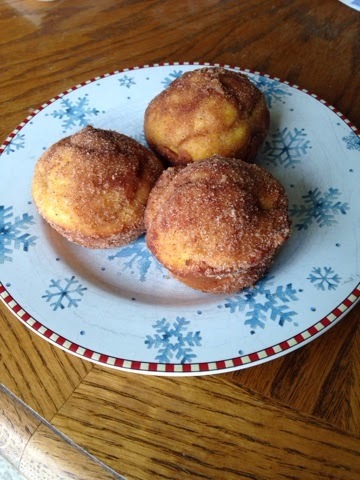 Remove from muffin pans, brush with butter and toss to coat in sugar mixture. You are really in for a treat! Thanks Martha!